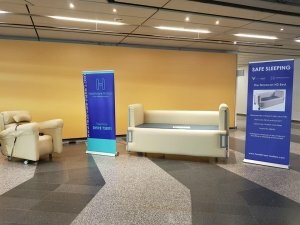 Last week Healthcare Matters exhibited the Novacorr Huntington’s Bed and Chair at the European Huntington’s Disease Network’s Plenary Meeting 2018. We met a whole host of inspirational people dedicated to supporting those living with Huntington’s Disease and fighting to eradicate it. We met the former EHDA President, Beatrice De Schepper, as well as the new incumbent Svein Olaf Olsen, pictured below with Keith and Nova of Novacorr, along with Adam and Geraint of Healthcare Matters. Representatives of many countries including Great Britain, Australia, America, Netherlands, Denmark, Belgium and Norway came to visit out stand and were very impressed with the products. We even took orders for the products on the stand! A few people who had been working long days after a long journey were happy to be able to ‘test’ the bed and chair for a few minutes restbite. Vienna is a beautiful city and it was inspirational to be surrounded by such positive energy.